Call it a bistro, brasserie, café or diner: this SLC restaurant delivers warmth. In City Weekly’s online restaurant listings alone, there are twenty different restaurants called “bistros.” They range from J. Wong’s Asian Bistro and P.F. Chang’s China Bistro to Zinn Bistro, Wild Grape New West Bistro, The Point Bistro and Indochine Vietnamese Bistro. With the exception of Vienna Bistro and maybe the pricier Paris Bistro, none of the local bistros are quite what I have in mind when I think of the word bistro. But then, the first bistros I ever set foot in were in Paris; later, I frequented New York City bistros that were modeled on the bistros of Paris. Generally, these are modest eateries with modest prices, a certain classic décor and informal service, which tend to feature braised and grilled meats and seafood; nothing fancy. Some of our local bistros fit the bill food-wise, but certainly aren’t modestly priced. Others are bistros in name only. Not that I’m particularly fussy about the term “bistro.” A lot of places are called bistros these days because, in part, I think it just sort of sounds cool, makes marketing-types happy and gives a restaurant a slightly exotic cachet. So, if you want to call your place a bistro, knock yourself out. I raise the bistro question this week in relation to The Olive Bistro, which certainly fits the standard definition of what a bistro is, insofar as it’s an informal and inexpensive place to dine. The food, though—mostly paninis, tapas and salads—is not really standard bistro fare in the traditional, Parisian bistro sense. But, as I say, I’m not a stickler. Whatever you want to call it—bistro, brasserie, café or diner—The Olive Bistro is, hands-down, one of the friendliest eateries I’ve ever visited—something I can’t say about most of the Paris bistros I’ve frequented. 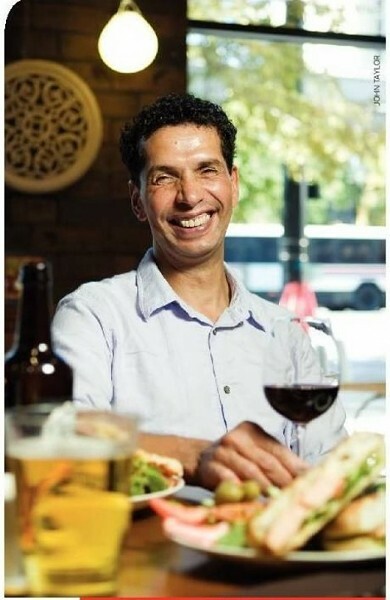 Olive Bistro owner Hassan Salami is, simply, one of the nicest guys you’ll ever meet. An ex-engineer, he came to Utah by way of Casablanca and Paris. During one conversation with Salami, he learned that I’d spent some time in Morocco, and was thrilled to know that I had an acquaintance with some of his homeland’s cuisine, such as pastilla, couscous and tagine. He tends to shake hands a lot and end conversations saying, “It’s so nice to speak with you again!” He’s the type of restaurateur I root for. And by the way, he didn’t know I was a restaurant critic. The Olive Bistro space (formerly L’Astelier) has a Buddha Bar-type groove (Salami’s nephew was a Paris DJ and supplies the tunes), dark wood tables and chairs, cabinets showcasing the restaurant’s wine and beer selections, and distinctive wall art. There are also metal tables and chairs out in front for al fresco dining in warm weather. If you haven’t visited The Olive Bistro since its earliest days, you might be happy to know that there’s now full table service—no more ordering at the counter. The Olive Bistro menu has also expanded. There are now more than fifteen different paninis to choose from, as well as eight salads and an assortment of interesting antipasti/ tapas, including crostini and bruschetta. The drink menu now includes a varied selection of imported and domestic wine and beer, as well as specialty coffee drinks featuring Italian Lavazza coffee, Mighty Leaf teas, and even good old natural cane sugar bottles of Coca- Cola from Mexico. I’m happy to see that certain menu items from early days have been dropped, like the shrimp “carpaccio” salad, which wasn’t at all carpaccio. Warm pita with fresh hummus ($6.99) is always a smart way to start at The Olive Bistro, as is crostini—you have a choice of crostini with goat cheese, Gorgonzola, wild prawns or wild salmon. The salads (“salade” on the menu) are generously portioned, lightly dressed and come with extra dressing on the side, a nice touch. Each salad at The Olive Bistro can be enhanced with wild salmon, prawns or garlic-herb chicken for an additional $3. All salads at The Olive Bistro begin with organic greens, and the Mediterranean and Tuscan salads were both very good, although a colleague of mine took exception to the pitted green olives (presumably from a can or jar) mixed in with the fresh olives in the Mediterranean salad. I also thought it a tad odd that the Tuscan salad—mixed organic greens tossed with thin-sliced yellow tomatoes and green peppers, with grilled pesto bruschetta and garnished with slivered strawberries—was topped with squares of pepper jack cheese. Why not fresh mozzarella in a Tuscan salad? For fresh mozzarella you’ll need to order the simple-but-delicious tomato, basil and mozzarella panini ($8.99). All panini sandwiches at The Olive Bistro come with a side salad of mixed organic greens, cucumbers, a trio of sweet peppers and tomatoes, as well as blue corn tortilla chips and chunky salsa (Pace, I think). The paninis are made with grilled ciabatta-style bread from Vosen’s Bread Paradise and are, blessedly, not overstuffed. The salami, sun-dried tomato and provolone panini ($9.99), for example, is just one or two very thin slices of salami and cheese, adorned with sundried tomatoes, green peppers, tomato and cucumber. Every bite is a taste sensation, even more so if you opt for the Creminelli truffle-infused salami sandwich. Your best bet though—and the panini Salami always recommends—is the wild salmon panini with provolone and fresh basil. It might sound like an odd combination on the surface, but it’s surprisingly delightful. And that’s probably the best way to sum up Hassan Salami and his Olive Bistro: Surprisingly delightful.